From interviews conducted since the Apple Watch was released it’s clear that, originally, Apple had no firm idea about how it might be received or used. Today, the Series 3 upgrade and recent improvements to watchOS make it plain that Apple believes that fitness tracking is the key reason people buy their watches. I am no fitness fanatic, just a guy in his sixties trying to slow down the effects of old age. But the Series 3 has significantly improved my ability to consistently carry out the modest fitness-maintaining activities I’d previously struggled to do on a regular basis. These days I walk, do yoga, and stack and carry a few cords every year for our wood-burning stove. The Apple Watch’s basic indication of the amount of these activities is a set of colored rings that concisely display your desired daily levels of exercise, movement, and standing (i.e. not spending hours sitting in a chair without a movement break). Adding these to your customized watch face allows you to notice your progress every time you glance at your watch. The continual reminder, with the subtle motivation to close all the rings by the end of the day, really helps me to stay faithful to my modest daily exercise goals. Although I rarely have a problem taking breaks since my adoption of Pomodoro, I love how the watch buzzes my wrist with a little reminder on the rare occasions I’ve been too couch potato-ey (which means at 10 minutes before the top of every hour when it senses you’ve been inactive for 50 minutes). A friend of mine was feeling under the weather recently. He finally went to the doctor where they discovered that his heart was beating abnormally fast — 130 beats per minute (BPM) at rest. He needed urgent treatment. The Apple Watch has an accurate continuous heart monitor that can be set to notify you if your heart rate remains above a given BPM while you’ve been inactive for 10 minutes. Graphs of your daily heart rate are available. They’re interesting to occasionally peruse and it’s unlikely that I’ll find myself in my friend’s situation without knowing about it right away. I appreciate the heart health monitoring that my watch provides. The watch generates different kinds of haptics. These are sensations created by tiny motors at the back of the watch that deliver real-time tactile feedback on the skin below. Haptics can feel like a gentle tap on the wrist or something more complicated. A consistent haptic indicates distinct notifications and situations. For example, if you’re walking to a destination in an unfamiliar city, Apple Maps can guide you there. Your watch can tell you when you need to turn left by playing two taps three times in a row, turn right by playing twelve steady taps on your wrist, and that you‘ve arrived at your destination by using a long vibration. Unlike the beeps, rings, and loud buzzes from other mobile devices, haptics are unnoticeable by anyone except the watch wearer. Once I’ve set up my destination in Maps, I can walk there without ever touching or viewing my phone. If I’m eating dinner with friends I can choose whether or not to ignore a tap on my wrist. And if I want to see a notification, a discrete turn of my wrist towards me turns on the display. This is usually unnoticed by my companions and certainly less obtrusive than dragging my phone out of my pocket or staring at it on the table. Haptics is a subtle new way to communicate. It has its limitations, but I find it a great improvement over the obvious intrusions of pre-Apple Watch digital devices. Last week I watched Walk With Me, a documentary about the Vietnamese Buddhist monk Thich Nhat Hanh. I learned that his Plum Village monastic community rings “bells of mindfulness”. When residents hear one, they stop all conversations and whatever they are doing and bring their awareness to their breathing. I like to meditate, and the Apple Watch includes a simple app named Breathe that reminds users every five hours (default) to take a moment to relax and take deep measured breaths. 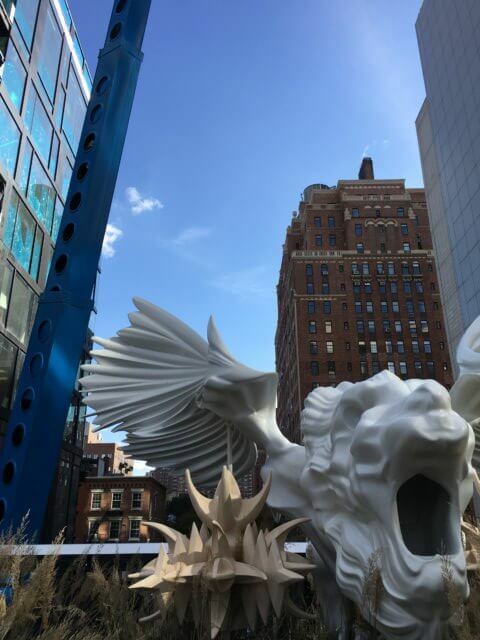 You can ignore the reminder or take a few minutes to bring attention to your breath, guided by a lovely haptic that provides a sequence of graduated speed taps to synchronize with your in-breath. The default Breathe session is one minute of seven breaths. However, the iPhone Watch App can easily adjust this to remind a user to breathe mindfully as often as every hour and fine tune the number of breaths per minute and the number of breaths per session. During a Breathe session, a pattern on the watch face expands and contracts to indicate in and out breathing, but I find the haptic feedback sufficient to meditate on my breath with my eyes closed. One can, of course, simply meditate in the traditional way with no gizmo telling you when to mindfully meditate. I like the Breathe app’s periodic gentle reminder to check what I’m currently experiencing and the opportunity to center myself and help bring me back to living in the present. Rather like the bells at Plum Village. Messaging “hands free” has become possible while my phone’s still buried in my pocket. I say: “Hey Siri, send a message to Celia”, and dictate it after the “What do you want to say?” response. Siri’s voice recognition is very good so there’s rarely a transcription problem with simple messages. The first time I did this while driving, Celia was alarmed until she discovered I’d never touched my phone! I frequently need triggers (aka timers and alarms) to remind me of future things I need to do. For example, take a break (as per the Pomodoro practice mentioned earlier), go to the post office before it closes, check the wood stove which I left on updraft, make a phone call, etc. I used to use small digital timers to do this. But with Siri on my wrist it’s simple to say “Hey Siri, set a timer for ten minutes”, or “Hey Siri, set an alarm for 12:30 pm”. Siri faithfully reminds me with a haptic tap when my timer or alarm is due. I can stop it with a single tap or pause/snooze it with a slide and tap or a Siri command. Setting triggers via Siri is so easy that I set many more reminders than I did before. This enhances my imperfect memory and improves the likelihood that I’ll actually be doing what I’ve agreed to do when I need to do it. I wear my watch pretty much all the time, including while I sleep. No, the watch has not become a fetish object or a substitute teddy bear, but I’m taking advantage of a sleep app Pillow to monitor my sleep. It’s a fully functional free app, though you can pay $4.99 (which I did) to unlock a few extra features. As I age, my sleep quality has declined (at least it feels that way). 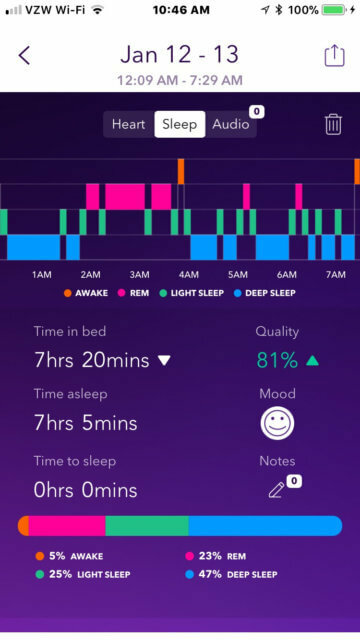 Pillow provides an interesting window into my sleep, allowing me to explore the effects of bedtime routines, medication, etc. I’ve learned, for example, that I don’t sleep as much as I thought I did. Also, I hardly snore (the app includes optional recording of sound via the watch microphone). The pretty graphs of my sleep state aren’t totally accurate — I sometimes know I was dreaming when I woke but the app doesn’t think I was in REM state. But day-to-day comparison is enlightening and helps me improve my sleep hygiene. I’ve owned quite a few watches over the years. Whenever I’ve looked for a new one I’ve had a hard time finding a watch face I like. My criteria seem simple. 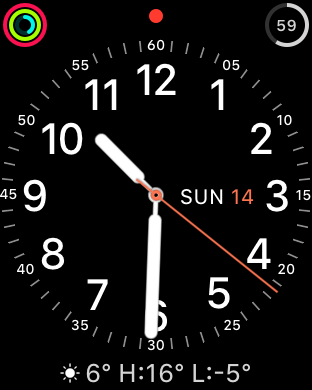 An analog face that shows all the numerals, a second hand, and a readable day of the week and date. Sounds straightforward, but less than 1% of conventional watches supply this combination. This isn’t a problem with Apple watches, which come with plenty of customizable faces. I quickly created exactly what I wanted (see the screenshot). You can have multiple faces for different circumstances available with a swipe. The one I use handles what I need at a glance. After years of wearing leather bands that eventually distort and fall apart, I love my Milanese Loop. It’s the first comfortable metal band I’ve ever worn. The infinitely adjustable magnetic metal closure is brilliant and works perfectly. I bought the Apple version. 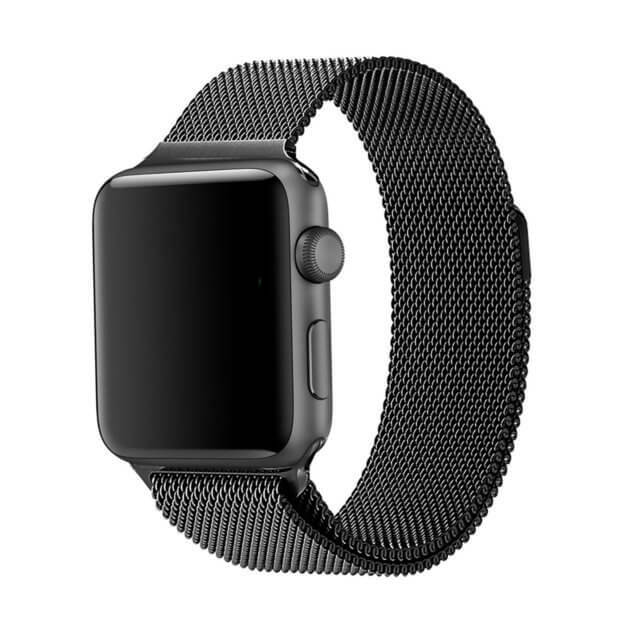 Some of the imitation bands that cost a fraction of Apple’s price have good reviews. The watch is charged magnetically and charging is quick. I pop the watch on the inductive charger a couple of times a day for 20-30 minutes. Even though I’m wearing the watch almost constantly (see above) I’ve never come close to a low battery situation. 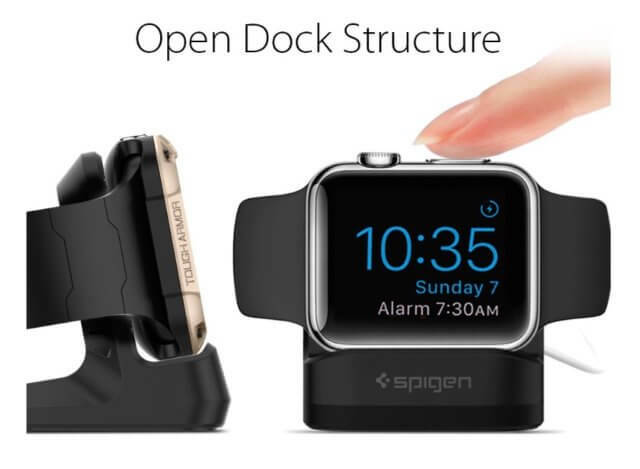 While we’re on the topic, the $7.95 Spigen S350 Apple Watch Stand creates the perfect travel alarm clock as long as there’s power near the bed. I say “perfect” because the stand holds the watch vertically in Nightstand mode, where the time display turns off until it’s tapped or detects even the slightest motion/sound, and you can easily set an alarm with Siri. There are multiple ways you can interact with the Apple Watch (tap, slide, force touch on the watch face; press, rotate the Digital Crown; press the side button; “Hey Siri”) that initially felt complicated. However, getting the watch to do what I want has become fairly intuitive, though I occasionally fumble for a moment. Notifications are convenient and completely customizable. I appreciate the automatic “do not disturb” feature at night. It’s easily turned on with a slide and tap while meditating or doing yoga. Even the watch’s “flashlight”, though dim, has been useful far more than I expected. There are many other apps available for the Apple Watch besides the ones I’ve mentioned, but I barely use them. Yes, it’s impressive that I can squint at a weather radar map on my watch, but the small display area really limits its usability to viewing limited information, like a short message or tweet. It’s also quite hard to pick a rarely used app from the cloud of icons; it’s easier to have Siri do it (provided I can remember the app name). The Apple Watch Series 3 is a fantastic device that has had many unexpected positive impacts on my life. I hope sharing them will help you decide whether a device like this is valuable for you. This entry was posted on Monday, January 22nd, 2018 at 6:28 am	and is filed under life lessons, Technology. You can follow any responses to this entry through the RSS 2.0 feed.You can leave a response, or trackback from your own site.